Week 9 of the NFL season is set to kick off and while there are a ton of great games and many different good betting options on the board, one game that sticks out though is the Miami Dolphins heading on the road to take on the Indianapolis Colts. This should be a match-up of two rookie quarterbacks as long as Ryan Tannehill recovers from his injury in time, and it’s a game that has the potential to be very interesting. The line tells a lot about this one as the Dolphins are -1 on the road, showing that they are getting a slight edge, but you can’t overlook the Colts this season with Andrew Luck running the show it seems. This game is set to kick off at 1:00pm on Sunday, and both teams have been more than surprising to this point in the season. Both the Dolphins and Colts are 4-3 and are showing that their young quarterbacks are very possibly the answer. The Dolphins’ defense has been big this year, and that definitely includes their ability to slow down the run. They’ve stepped up in a big way, and made life a whole lot easier on Tannehill. Expect the Dolphins to attempt to throw a whole lot of Reggie Bush at the Colts, and that includes him both running the ball and catching passes out of the back field. The Colts defense really needs to find a way to slow down both Bush and Tannehill to help out Andrew Luck. The Colts on the other side are going to let Andrew Luck roll. He’s been getting some support from Vick Ballard, and Donald Brown is back from injury. The biggest player that I’ll have my eye on here though is Reggie Wayne. Wayne looks great with Luck running the show, and both of these teams are very much in the playoff talks. Getting a win against another team above .500 would be huge, and for the Colts, going from the top pick last year to already being 4-3 is something that the fans and front office are ecstatic about. Looking for great odds on this game? Check out this top sportsbook! The Miami Dolphins are small -1 favorites in this game and the over/under line is set at 43. Expect a fun game for starters, because this game has the potential to be pretty high scoring, but it really could go either way. 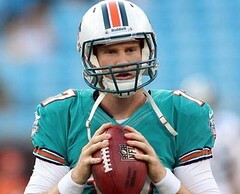 If Tannehill is good to go then he’ll be in there for the Fins’, if not though then it’ll be on back-up Matt Moore. Both quarterbacks have some solid potential, but in the end I don’t think they’ll be able to out-duel Andrew Luck on his home field. The Indianapolis Colts fans are excited about the direction of this team, and especially the fact that they are so young with players showing some talent also. Luck will step up late in this one and help the Colts pull out a win. I expect this line to move around a bit and I think that the Colts could even end up being -1 or it could be a pick when all is said and done. 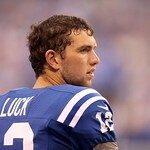 Our betting pick is Indianapolis Colts -1 and no bet on the total.